Is Alzheimer's An Infectious Disease Like Mad Cow? "We took a normal mouse model that spontaneously does not develop any brain damage and injected a small amount of Alzheimer's human brain tissue into the animal's brain. The mouse developed Alzheimer's over time and it spread to other portions of the brain. We are currently working on whether disease transmission can happen in real life under more natural routes of exposure." 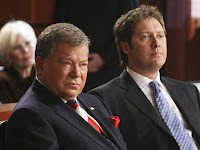 Some of you might recall the television show Boston Legal. One of the shows leading characters Denny Crane (William Shatner) referred to his own developing dementia as "mad cow's disease". The show caught my attention for its artistic treatment of Denny's dementia. At the end of show, Denny and Alan Shore (James Spader) went all the way to the Supreme Court to get Denny access to a drug that was in a clinical trial but not yet available for purchase. They won the right for Denny to get the medication. I believe the drug in question was Dimebon. Dimebon failed in a clinical trial although it still has one shot left. The results in my opinion show how out of touch our regulators are, meaning the FDA, with the reality of Alzheimer's disease. The drug did not prevent the loss of memory, so it failed. What the drug did do was improve behavior. My mother was enrolled in the Dimebon clinical trial when the "rug was pulled out from under us". The clinical trial in which she was enrolled was cancelled. I wrote here extensively, mostly under the guise of Dotty, about how the drug, Dimebon, was having an incredible positive impact on my mother's behavior and awareness. See Dimebon - 12 Wonderful Weeks - The Miracle that was Ours, and, Reflections on Dotty and Dimebon. Now to mad cow and Alzheimer's. The report on the research below is fascinating and interesting. Imagine, giving a mouse Alzheimer's from human brain tissue. Mad cow? "Our findings open the possibility that some of the sporadic Alzheimer's cases may arise from an infectious process, which occurs with other neurological diseases such as mad cow and its human form, Creutzfeldt-Jakob disease," said Claudio Soto, Ph.D., professor of neurology at The University of Texas Medical School at Houston, part of UTHealth. "The underlying mechanism of Alzheimer's disease is very similar to the prion diseases. It involves a normal protein that becomes misshapen and is able to spread by transforming good proteins to bad ones. The bad proteins accumulate in the brain, forming plaque deposits that are believed to kill neuron cells in Alzheimer's." The results showing a potentially infectious spreading of Alzheimer's disease in animal models were published in the Oct. 4, 2011 online issue of Molecular Psychiatry, part of the Nature Publishing Group. The research was funded by The George P. and Cynthia W. Mitchell Center for Research in Alzheimer's Disease and Related Brain Disorders at UTHealth. Alzheimer's disease is a form of progressive dementia that affects memory, thinking and behavior. Of the estimated 5.4 million cases of Alzheimer's in the United States, 90 percent are sporadic. The plaques caused by misshapen aggregates of beta amyloid protein, along with twisted fibers of the protein tau, are the two major hallmarks associated with the disease. Alzheimer's is the sixth leading cause of death in the United States, according to the Alzheimer's Association. Researchers injected the brain tissue of a confirmed Alzheimer's patients into mice and compared the results to those from injected tissue of a control without the disease. None of the mice injected with the control showed signs of Alzheimer's, whereas all of those injected with Alzheimer's brain extracts developed plaques and other brain alterations typical of the disease. "We took a normal mouse model that spontaneously does not develop any brain damage and injected a small amount of Alzheimer's human brain tissue into the animal's brain," said Soto, who is director of the Mitchell Center. "The mouse developed Alzheimer's over time and it spread to other portions of the brain. We are currently working on whether disease transmission can happen in real life under more natural routes of exposure." UTHealth co-authors of the paper, "De novo Induction of amyloid-B Deposition in vivo," are Rodrigo Morales, Ph.D, postdoctoral fellow, and Claudia Duran-Aniotz, research assistant. Other co-authors are Joaquin Castilla, Ph.D., Basque Foundation for Science, Bilbao, Spain; and Lisbell D. Estrada, Ph.D., Universidad Catolica de Chile, Santiago, Chile. Duran-Anoitz is also a doctoral student at the Universidad de los Andes in Santiago, Chile. Soto, Morales, Castilla and Estrada did a portion of the research at The University of Texas Medical Branch at Galveston.